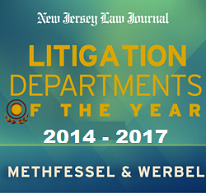 Mr. Werbel joined the firm following a successful clerkship with the Honorable Edward W. Beglin, Jr., Assignment Judge of the Superior Court in Union County. At Tulane he specialized in environmental litigation and regulatory actions, receiving a certification in Environmental Law as well as a J.D. Mr. Werbel presently represents insurance carriers, insureds, and self-insureds in the investigation and defense of both first and third-party claims. Mr. Werbel handles cases in many areas, including environmental, fraud, first and third party coverage, inland marine, liability, and subrogation. Additionally, Mr. Werbel has successfully argued several cases before the Appellate Division including several that were approved for publication. Mr. Werbel also handles substantial subrogation claims including the early investigation of those claims. Mr. Werbel has also presented many seminars on topics such as Mold, Bad Faith, Unfair Claims & Settlement Practices Act, Staged First Party Claims, Application Fraud, Collapse and Duty to Defend Negligent and Intentional Torts.